Quarter white meat with rice & peas and cole slaw. Anntony's Caribbean Cafe on 7th St. was a favorite of my youth. Back then the dining room was much larger but now the restaurant focuses on catering and take-out with a few tables indoors and on the patio. The tangy sauce here is SO GOOD. The waitress told me they had to take the bottles of sauce off the table because people were taking the whole bottle! 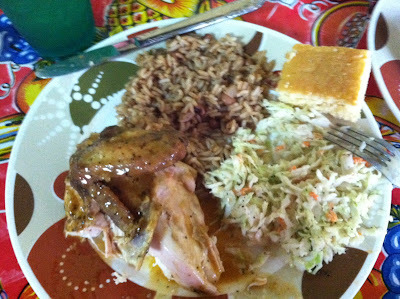 I love the combination of rice, slaw, sauce and chicken here. So good. Calvin enjoyed his curry chicken as well although the corn bread was a little dry. Try the swank - a tasty nonalcoholic drink that tastes like a combination of lemonade and iced tea. Wing platters, pork chops, pork ribs, collards, and mac & cheese (Monday only) are also offered. Glad to be back in town so I can come back to Anntony's often! 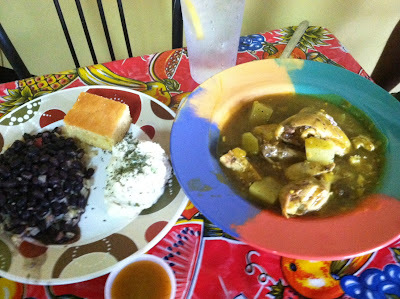 Curry chicken with calypso rice topped with black beans and potato salad.